It’s crazy how fast this year has flown by as we are already in October ! Continuing to focus on balancing your fertility diet is extremely important for those who are new to the conception journey or who have been TTC for some time. Your fertility diet is probably one of the single most important areas of focus while you are on this journey to conceive. So much so, that I spend a lot of time in this area — as I have shared with you in previous posts, eating a balanced meal with plenty of vitamins and minerals is super critical to your body’s overall success in conception and maintaining a healthy pregnancy. Eating well and nourishing your body requires commitment and dedication, and you will reap the benefits. For this month’s post, I want to share an awesome recipe that is both nutrient dense equally yummy ! 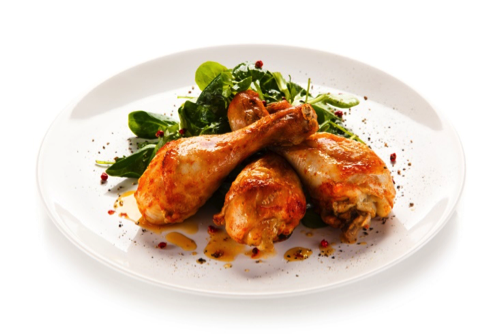 Spray the bottom of a glass baking pan with coconut oil, and place chicken legs and wings in it. Add sea salt, onion powder, ground black pepper over the chicken. Add in touches of the minced garlic over the chicken pieces. Squeeze fresh lemons on top of chicken. Add the lemon rinds to give it more flavor. Bake at 375 degrees until the chicken is well done. While the chicken is baking in the oven, prepare a roasting pan by coating the bottom with cooking oil. Peel the squash and beetroot and cut into chunks or cubes. Add sea salt to the mixture. I also drop in a touch of Irish butter when roasting but this is optional. Roast veggies to desired consistency. Once the chicken is baked and veggies are roasted, you are ready for a hearty and delicious sampling of flavors that yield tremendous nutritional value. I also recommend serving the chicken and roasted veggies with a healthy portion of green, leafy veggies, such as steamed broccoli or sautéed spinach. Filled with a ton of vitamins and minerals as well as protein, this meal is sure to please. And, the chicken makes for delicious leftovers !